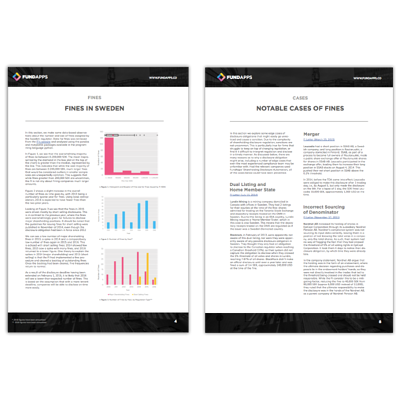 This summer, a small number of the FundApps team started work on a whitepaper covering the ins-and-outs of shareholding disclosure in Sweden. That whitepaper was finally completed this week and we are delighted to announce that it is ready to download. The whitepaper expands on some of the points raised in our previous blog post, ‘Understanding Swedish Disclosures’. To gather the data, FundApps used custom software to mine information made public by the Swedish regulator, which was then subject to statistical analysis. Fines and filings from over 30 countries were examined, covering thousands of different companies across many different industries. The largest fines ever issued by the FI exceed 1,200,000 SEK. 2015 saw more shareholding disclosure fines issued than ever before. The average fine size for short selling disclosure contraventions has climbed for three consecutive quarters. Nearly 75% of US and UK companies with disclosure obligations in Sweden are investment management companies. Foreign companies are approximately 30% more likely to be fined for shareholding disclosure contraventions in Sweden than domestic ones. One of the main aims of the whitepaper, titled ‘Shareholding Disclosure in Sweden: Obligations and Sanctions', was to provide examples of common errors companies had made. It includes some case studies, exploring how mistakes in aggregation, dual listing and even corporate action have resulted in fines over the last six years.